July 13, 2017, Mumbai: Mahindra & Mahindra Ltd., a part of the US $19. 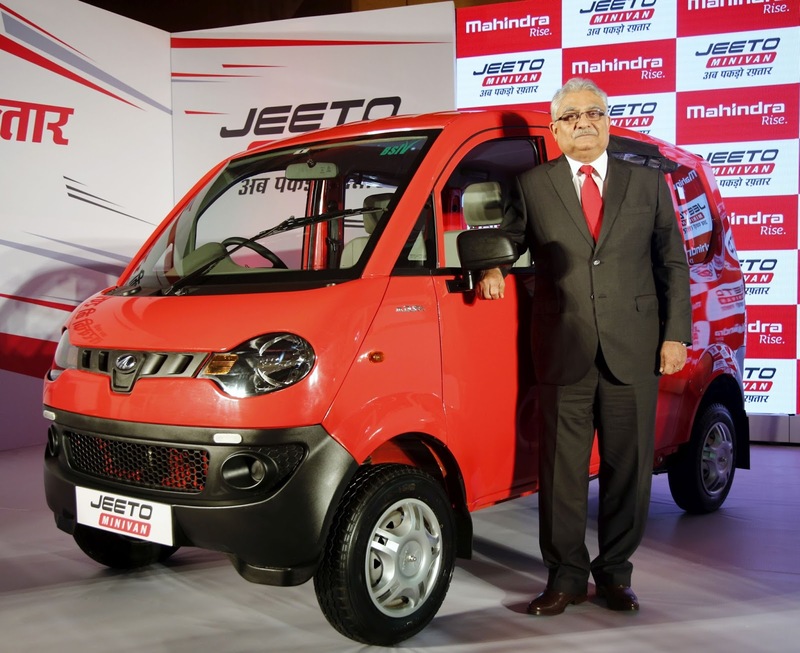 billion Mahindra Group, today announced the launch of Jeeto Minivan, its stylish and comfortable passenger carrier developed on the successful Jeeto platform. The Jeeto Minivan is best suited for urban and semi urban modes of transportation and will cater to last mile connectivity, contract and stage carriage for tour/travel and intra-city people movement. Priced competitively, the Jeeto Minivan starts at Rs. 3.45 lac (ex-showroom Mumbai for BSIV diesel variant) and will be available in two body forms, namely hard top and semi hard top and 3 fuel variants of diesel, petrol and CNG. The Jeeto Minivan is powered by m_Dura, a Direct Injection (DI) and BSIV emission compliant engine from the Mahindra stable. Designed for superior performance with a class leading power of 11.9 kW (16 HP) and torque of 38 Nm, the Jeeto Minivan is well suited for all terrains. It has the ability to do more trips and delivers best in class fuel efficiency of 26 km/l. * Further the Jeeto Minivan, with its lower maintenance cost, fatigue free car-like drive-ability , spacious cabin & well-cushioned seating for best in class comfort and a distinctive exterior styling, offers much superior value proposition over its competitors. The Jeeto platform was conceptualised to effectively cater to the needs of multiple segments in the passenger and cargo movement categories. It delivers a superior value proposition with its existing and popular Jeeto Minitruck and the newly introduced Jeeto Minivan. In its endeavour to upgrade the 3 wheeler customers to Jeeto Minivan, the company has introduced attractive exchange and finance schemes with significantly low down payment options and a longer tenure for affordable EMIs. The Jeeto Mini Van comes with a class-leading warranty of 2 years/40,000 kms (whichever is earlier) and the customers can choose from its 3 attractive colours of Sunrise Red, Ultramarine Blue and Diamond White. It will be launched in a phased manner. In its first phase the semi hard top diesel variant of the Jeeto Minivan will be launched. Over the next couple of months the Jeeto Minivan range will be completed with the launch of the hard top CNG and diesel variants and the semi hard top CNG and petrol variants. Jeeto has many car like features – such as well-cushioned seating and large cabin space with better headroom and legroom for greater comfort to make the journey more pleasant. The better ergonomics and car like smooth gear-shift quality further enhance the Jeeto’s fatigue free driving pleasure. The easy ingress & outgress for passengers and the lockable Glove Box also add to the convenience. The Jeeto Minivan is technically designed to meet the exacting requirements of customers. It is powered by m_Dura, the BSIV compliant Direct Injection (DI) engine that delivers a power of 11.9 kW (16 HP) and a torque of 38 Nm. It also boasts of best in class pick up. Besides its superior performance, it is extremely fuel efficient and gives a mileage of 26* km/l. Equipped with superior power and torque it leads the pack of passenger carriers in the segment, with ease of drivability, even on gradients. Jeeto Minivan provides the highest level of safety in its category. The cabin has been designed to provide better safety to the driver and co-driver in the event of a crash. In addition, (ELR) seat belt systems, head restraints and bucket seat provide safety against sudden impact. The Jeeto’s unmatched safety is due to its semi forward design, strong body, and superior chassis with larger wheel base of 2250 mm for better balance. The Jeeto Minivan’s compact size and smooth steering give it an easier maneuverability in narrow city lanes and by-lanes. Further, the vehicle also boasts of best in class pick up and acceleration for better drivability on busy city roads. The Jeeto Minivan comes with a class-leading warranty of 2 years/40,000 km (whichever is earlier), which offers complete peace of mind. It also sports the veritable Mahindra DNA of being tough and rugged, making it best suited for all types of terrains. To add to this, the widespread Mahindra network facilitates easy repair and service.